Are you funny and spastic like Pee-Wee Herman? Are you reliable and cushy like Chairy? Are you pretty and sweet like Miss Yvonne? Why don't you find out for sure, right here! All you have to do is, read the rules, join the community and post your application IN THAT ORDER! Sound like fun? Let's get started! 1. YOU MUST HAVE FUN HERE! But learning is optional. 2. Play nicely! Having fun at someone elses expense is not what the playhouse is about. Harrassment will not be tollerated here. 3. Scream real loud whenever you hear the secret word and place it somewhere in your application! There will be a new word each month. If you don't know what it is, just ask Conky! He'll tell you all of the mod's latest updates! 4. No off-topic posts(this includes political discussions)! 5. No smoking or flaming. 6. Please put all long posts under lj cut. 7. If you are uncertain of the appropriateness of a post, contact the mod. 8. Feel free to ask for anything from Jambi! This community is about creativity and fun, so if you're not having fun, let us know so we can fix that! 1. To prove you have read the rules, please write "I know you are, but what am I" somewhere in your application. It doesn't have to be part of the title or the lj-cut title, but if it appears anywhere else, please bold it because your mod can be a little short-sighted sometimes. 2. Please vote for all of the members who haven't been stamped yet before posting your own application. You can find them all HERE. 3. Please do not post any photos of yourself until you have been stamped. 4. 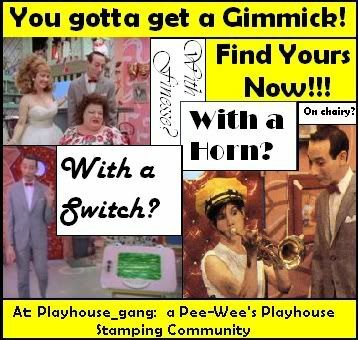 Even if you aren't stamped you may still participate in the playhouse activities. 5. You cannot be stamped as a group or pair(ie the dinosaur family, the flower box, the fish, the stuff in the refrigerator or the entire ant farm). 6. Please bold all of your votes. 7. If you see two different characters in one person than you may vote for both of them, but no more than 2. Also, if the applicant has requested to be stamped as both a human and a non-human please leave them only one vote for each(That's one human vote and one non-human vote). 8. You don't need to be stamped to vote. 9. No one shall EVER accuse anyone else of character pushing! (Sorry, mod's pet peeve and it promotes dis-trust!) You must accept that there are people out there who, ironically, are very much like a particular character. Let's stick to our honor/respect system! 10. If you need some help check out the character guide! 11. After you have recieved five votes (or when your lazy mod gets around to it) you will be stamped. 12. If you are unsatisfied with your stamp, you may reapply if you wish, but please wait 3 weeks before doing so. 13. Check out our Stamped Members List! Pee-Wee, Chairy, King of Cartoons, Miss Yvonne, Pterri, Jambi, Captain Carl, Conky, Dixie, Cowboy Curtis, Globey, Li'l Punkin, Mrs. Steve, Mr. Window, Mr. Kite, Mrs. Renee, The Cowntess, The Salesman, Tito, Magic Screen, Reba, Ricardo, Randy, Mr. Knucklehead, Floory, Chicky Baby, Dirty Dog, Cool Cat, Clocky, Dog Chair, Chandelier, or Roger the monster. If you'd like to become an affiliate and promote your community here, just ask Jambi. As you can see, your mod ainohimeliz has a very wide variety of tastes so your wishes are almost always granted. If you do become an affiliate make sure to make us one too!